InsulBrick is a tar coated fibreboard siding introduced in the 1930’s which remained popular up to and through the 1960’s. It has a slightly embossed stone or brick pattern and added granular material on the outer surface. It hasn’t been manufactured since the early 70’s, so what’s out there is the original material. All surviving examples show signs of aging, some gracefully, others, some may argue, not so much. Regardless, all suggest a rich history of protecting generations of occupants through many decades. Here’s a tour of dwellings that I’ve noticed in the area still wrapped in the stuff. First stop is on the edge of the Gatineau River along Rue Jacques Cartier, a bit north of the Lady Aberdeen Bridge. It appears to be holding its own. Next stop is in Hintonburg at the corner on Hinchey and Armstrong, not far from the Parkdale Market. This one’s my favorite. It has a bunch of nice touches, like an old wooden front door (not in picture) and round wooden porch columns. One senses a lot of tender loving care goes into maintaining this home. So there you have it – a tour of some of the few remaining InsulBrick covered houses in the region. Oct 2014 update – I’ve posted a second tour of Insulbrick covered houses in the region. Click here! I didn’t know that’s what it was called, or that it was discontinued in the ’70s. All the stuff, including the red-brick patterns too?? There are a few more in Centretown/Chinatown. 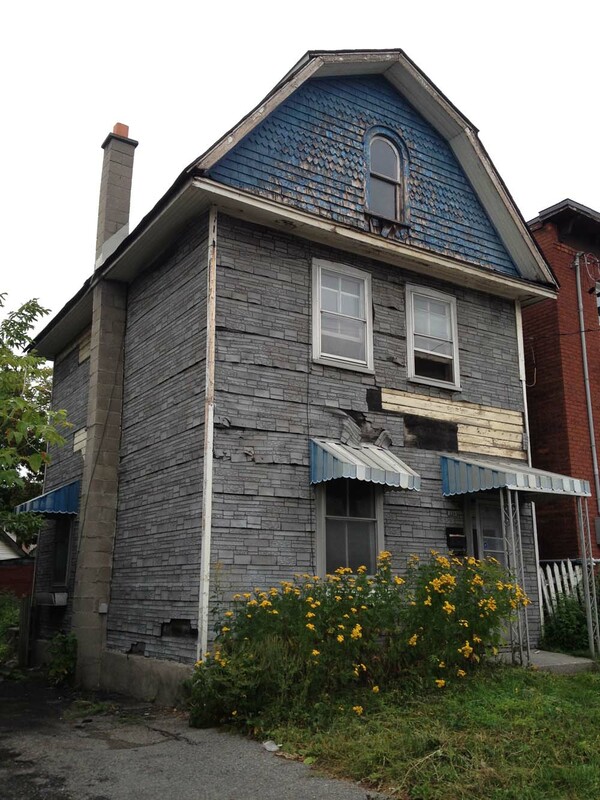 446 Lisgar is one, a hideous job of slapping red Insulbrick between the posts of an enclosed porch. And actually the one I was picturing in Chinatown is the one on Arthur you already have. I’ll keep my eyes peeled for more. There was some on the back of 255 Bay, one of the buildings demolished for Richcraft’s indefinite water feature (http://centretown.blogspot.ca/2010/03/bay-and-nepean-demo-part-2-255-bay.html#brick). Also in the heading of ‘fake brick’, on the south side of Lisgar Street, east of Cartier, some sidewalk was laid in asphalt and a brick-like pattern was applied to the asphalt, then painted over. Much of the paint has worn off. They did red brick patterns as well. I’ll go take a look at the one on Lisgar – thanks for the tip. 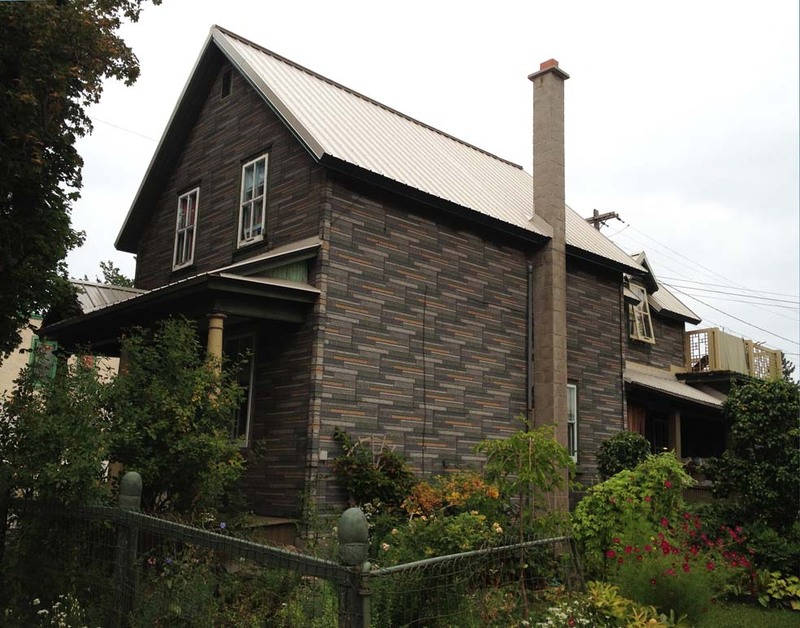 A friend messaged me that the back of his house in Sandy Hill was covered in Insulbrick. 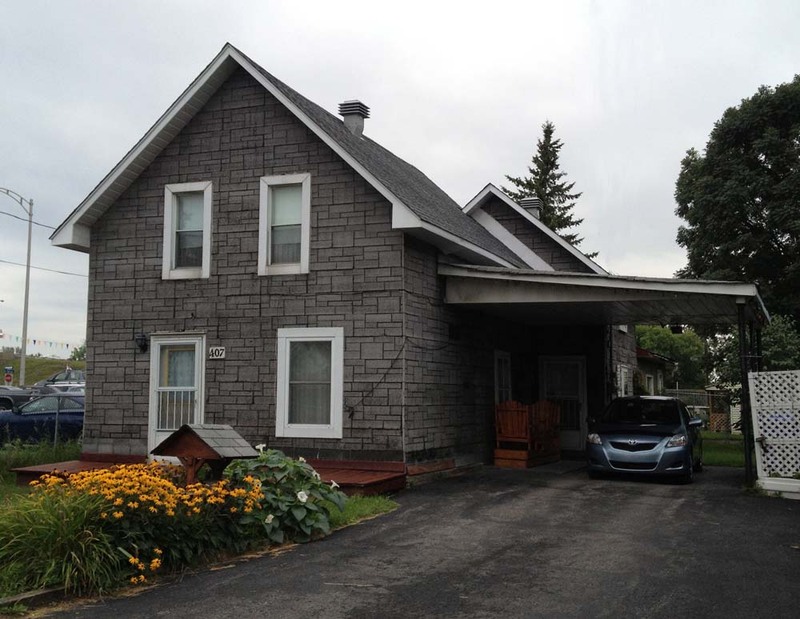 There must be many more houses in the region that have it hidden by layers of other more modern siding like aluminum or vinyl, as per the example you pointed out in your blog. My Mother has lived in the same house in Colton, CA since 1950. As far as we can research, the house has existed since 1906 (at least). We cannot find any records prior to that. It has the same Insulbrick siding (placed over the original wood siding) as in pictures 1 and 3 and is in remarkably good shape. My Mom has always hated it because you cannot really paint it, though she has done so on a couple of occasions. I was surprised to read that there are only a few homes that still have this siding. I guess it’s not that unusual when you figure these homes must be approaching the 100 year mark if they haven’t already. I believe it is safe to say that my Mother will be the last occupant of her home before it is eventually torn down. The zoning in the area now is M-1, Light Manufacturing, so it is not an ideal location for a family home. Let me add to that first comment that the house originally did not have electricity or plumbing, there is a window where the pantry would have been that has been constructed over with half of the window still exposed, you can even see the construction inside the wall, since the window pane is still intact. There is also a window in what would have been the original closet between the only two bedrooms originally in the house. It also had a pot belly stove for cooking and a ‘bath house’ connected to the structure but with an outdoor entrance located at the end of a porch that ran along the front and side of the home. The exterior area around the door (which is now on the interior of the house) still has the wood siding exposed since it was not part of the exterior any more when the Insulbrick was placed. It is right next to the railroad tracks and our family has always wondered if the house was in any way connected to the railroad back in the day.